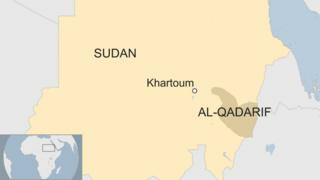 A helicopter has crashed in eastern Sudan, killing a state governor and at least four other officials. The helicopter exploded in flames after it hit a communications tower as it tried to land in the remote Al-Qadarif state, witnesses are quoted by AFP news agency as saying. No official reason has yet been given for the crash. A number of people were taken to hospital for treatment, state media reported, without giving more details. Among the dead are Al-Qadarif governor Mirghani Saleh, his cabinet chief, the local police chief and agriculture minister, the reports added. Sudan's military fleet includes many aircraft bought from the former Soviet Union. Eight people were injured in October when two of its planes collided on the runway at the airport in the capital, Khartoum. In September, two pilots were killed when a military jet crashed near Omdurman, Khartoum's twin city.